These are two images made with some old Japanese (Olympus, OM) lenses that are known for the quality of their out of focus rendering. They are not “photoshopped” or manipulated. This is the way the lenses (a different lens for each image) and camera made them. It’s interesting that the word “bokeh” came from Japan, a traditionally Buddhist country. While modern Japan is very westernized in many ways, there is a strong aesthetic tradition that permeates much of the culture, rooted in Zen. While many Japanese people are not practicing meditators, the philosophy based on meditation and Buddhist teachings still has a strong sway even in these modern times of technology and materialism — technology that can create consumer lenses with certain characteristics. Oddly enough, I wrote a paper on the influence of Zen on Japanese culture and aesthetics in high school, in about 1974. I had forgotten about that paper and studying this topic, until sitting at the keyboard right now. Back then I didn’t have a strong understanding of Buddhism — though I studied it for that paper — and really what it means at a deep level that can permeate everything. I was just interested in it and drawn to the aesthetic, even then as a mid-teenager. Weird. The aesthetic I’m talking about, of course, is art that places the importance of negative space as an equal, or even more important component of the composition, as the “subject” of the artwork. One famous example of this is the Enso calligraphy of Zen though of course it shows up in countless examples of oriental art. I think it’s less obvious in the Ukiyo-e prints, but the use of negative space is often very important there as well. I think it’s also interesting that some Japanese lenses seem to have good bokeh or amazingly excellent bokeh, as part of their design, while fewer German lenses (I’m looking at you, Zeiss) might in general be better at sharpness and contrast and in general not quite drawing the out of focus areas quite as beautifully. Though there are of course exceptions; for example this image was made with a vintage Zeiss lens that surprised me in rendering such beautiful out of focus areas. I don’t know Leica lenses, but I guess they are an exception to my cultural rule. In high school when I studied and observed the influence of Zen on culture, I really had no idea, just a hunch. And for years and years I had no idea at a deep level. After many long meditation retreats and thousand of hours sitting in meditation, I have had some understanding of what is going on here. (I am still far short of the 10,000 hours of meditation practice that some neuroscientists, I think Richard Davidson is one, say is the threshold where the brain really changes pretty drastically, and even shows unique qualities in FMRI machines. The two “happiest men in the world,” Matthieu Ricard and Mingyur Rinpoche, have been studied extensively along with some monks associated the Dalai Lama, showing that over 10,000 hours is a real change point). I had an experience in one long meditation retreat a decade ago, which lasted for the rest of that retreat, and then has become more reliable over the decade since then, with more retreats and more practice. That experience was in seeing “emptiness,” or Shunyata as it was called in early Buddhist languages. My Tibetan Buddhist meditation teacher, a real meditation master also is prone to talk about “space” as well. He once joked, “I’m not talking about made-in-India space. I’m talking about made-in-space space!” So what I experience quite a bit of the time is a shifting allegiance, shifting between what is there, and what is not as apparently sold, between a thing, a thought, an experience — and the space around it. In the case of a mental or emotional experience, which of course is our whole life, the “space around it” is a cognizance bigger than a mere thought or emotion. 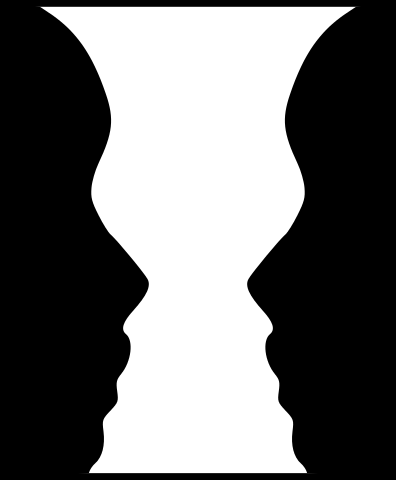 In that first breakthrough retreat, I conceptualized it as being like one of those figure-ground shifting images, like this one. It is two faces. It is a vase. It all depends on whether you have perceptual allegiance to the foreground or the background, the white or the black. This is most important when working with the mind, and I think meditation is the best way to develop this capacity. In the west, therapy can often also facilitate the cultivation of this kind of shift, because the therapist is hopefully helping provide a bigger view beyond what we normally think of as the “solid” aspects of our cognition, perception, and emotional experience. Experiencing nature, or perhaps religion, can also be some sort of access to a sense of space, but most of our experience in the west falls short of a Buddhist understanding of space or emptiness. This capacity is extremely important when working with emotions. When the emotional experience is all there is, then we often suffer from it, or cause others to suffer. The point is that the thought or emotion is just an isolated event, with little actual substance, like a drop of dew — an isolated not-even-really-a-thing that is surrounded by space. 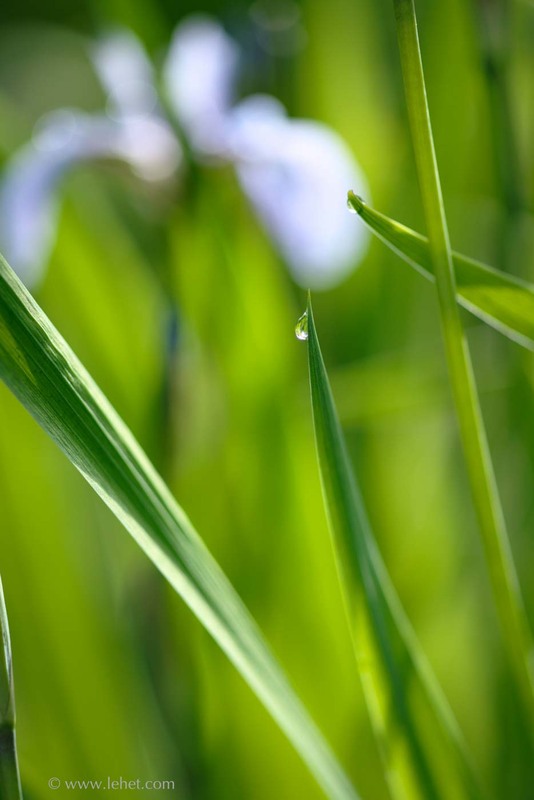 Like the dewdrop, it has very little actual substance, and certainly no permanence. While I think art that manifests this quality is often profound in itself, it may be more significant that it is pointing to something bigger, a truth, an experience that is more important and profound than art. I think since I’ve been meditating more seriously, over the last 15 years, my photography has changed quite a bit, but gradually. And I think it’s only more recently that I have a lot more comfort shifting between the figure and the ground, between what is there and what is not there in a conventional sense. Though in another sense, the ground represents something that is more real than what we normally take as real. That is an exploration I will leave for the reader. 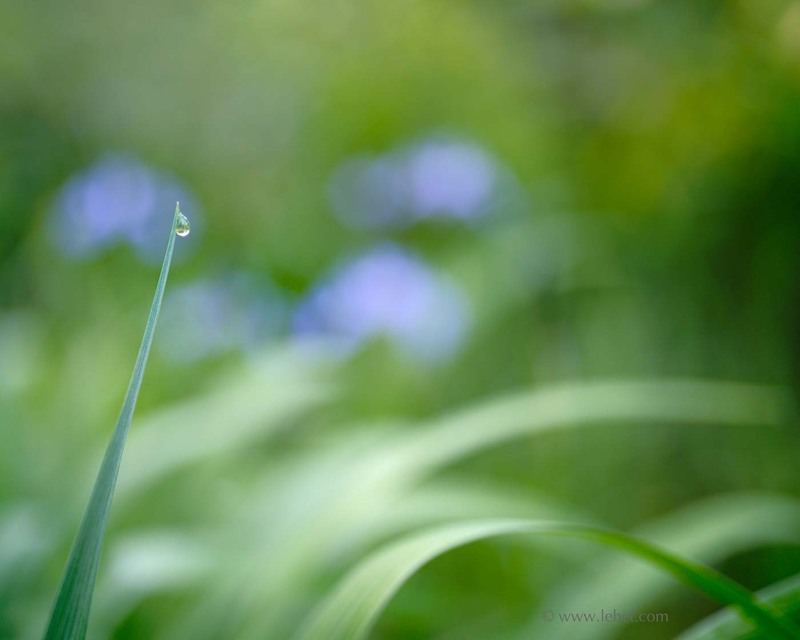 This entry was posted in blue, Bokeh, Buddha, Flowers, garden, Meditation, New England, summer, Vermont on October 21, 2017 by john lehet.